It’s very difficult to know definitively what we could have done better but here’s my best shot – without going into ridiculous detail or trying to analyse ad infinitum. We reckoned on crossing the start line around 90 seconds after the start and although we all agreed not to push this, in the end we thought we’d be over it before the gun and so put an extra tack in. The photo at the top of the main race report post shows us about 30s from the start at 08:21:01 and it seems that without being reckless (bear in mind we’re not professional racers) we could have shaved a minute off this. Very difficult to estimate but we didn’t do a very good job of constantly trimming the sails to our course. On close hauled tacks upwind (about 4½ hours) we didn’t do too badly but I know I was pinching too much and luffing up as a result. On the reaches and downwind legs we held a very good course – especially from the Needles to St. Catherine’s Point – but I’m not sure the sails were trimmed optimally. 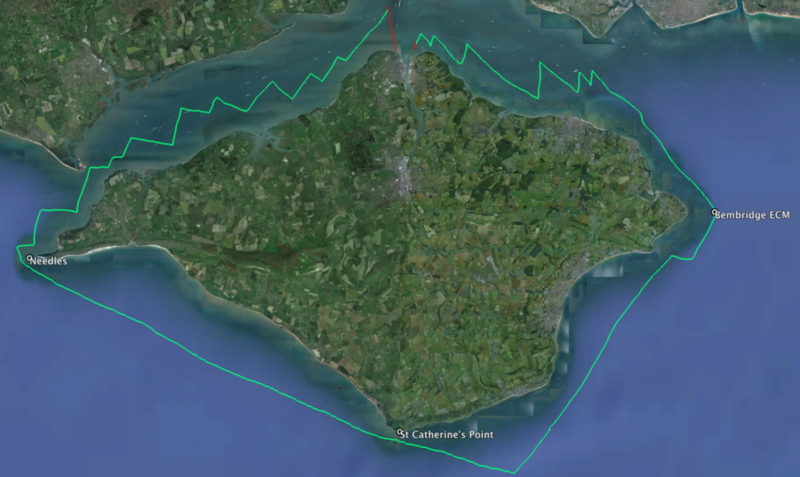 At an average speed of 6.41 knots (over the ground) around the course it’s not unreasonable to have achieved an extra 0.1 knot. This would have made a difference of 8m 46s. Hiking out on the rail means sailing the boat flatter and allows it to run faster through the water. I’ve always wondered how much of a difference this really makes until I was shown on a racing course run by Sailing Logic a few weeks ago. We were close hauled on starboard and the skipper asked two people to move from the rail to the leeward side without him adjusting the helm. The boat immediately turned appreciably to port demonstrating that in order to hold the course more helm would be needed causing more drag from the rudder and slowing her down. I don’t know how much of a speed difference this would make so I’ve lumped it in above. We made a total of 32 tacks on the upwind legs and these could certainly have been more efficient. I certainly didn’t execute very well when on the helm (not turning through the wind enough and bringing her back again) so we lost time on those for sure. But I think some other aspects let us down too. Coming off the rail too soon means you’ve got weight on the leeward side and the boat isn’t sailing as flat as possible for as long as possible. Taking the rope off the loaded winch on ‘ready about’ is fine but letting some of the load off early isn’t. It made it much more difficult for the lazy sheet to be pulled in hard which made winching inevitable and so less power in the head sail. Moving the traveller over early means you’ve effectively eased the main early and so less power. The crew on mainsheet just needs to work hard to get that done during the tack (or as soon as tacked) – sorry Pete! Say a conservative 10 seconds wasted per tack so that’s 5m 20s. It took us a long time to the get the chute hoisted and set properly due to inexperience. For much of this time we were on the main sail only so I expect we lost some ground during that phase. Maybe half a knot for 10 minutes so that’s 46s. This one is tricky but it’s possible to sail on two single tacks from St. Catherine’s Point to Bembridge Ledge, gybing once as you come round Monk’s Bay just past Ventnor. We weren’t happy sailing too close to a run because it’s dangerous (for us) to risk gybing and it’s also more uncomfortable. 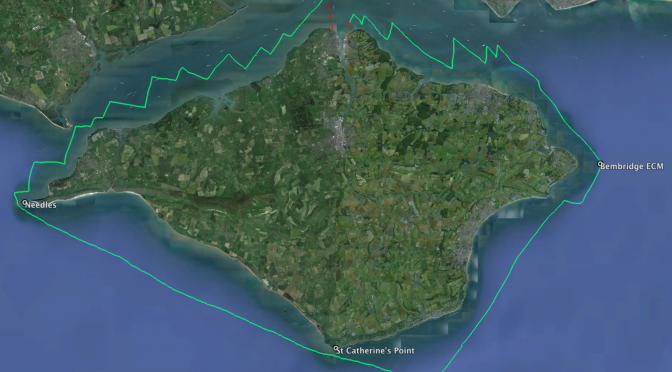 But even though we sailed well past St. Catherine’s Point so we could do it in one tack, we needed another as you can see from the track. Half a mile extra sailing is roughly 4m 30s. That would put our time at 9h 10m and corrected time at 9h 2m 19s – about 90 seconds behind Dignity.